Cobrapost is a non-profit news organization represented through its website and television productions. It upholds the finest traditions of journalism. Mainstream media platforms are today not spending as much as they should on news gathering ‘when it comes to matters of import. rt. Rather, journalism has been constantly trivialized, so much so.that frivolous matters are making the headlines. For media houses, stories that could hurt their advertisement revenues by exposing present and prospective clients, or their owners’ political and business network, go unreported, leading to a marked deterioration in the standards of journalism that we expect from our media platforms. Cobrapost intends to fill this gaping void that has arisen because of these mainstream media blindsports. News television in India is•driven by a viewership rating system that has a competitive need to increase audiences, especially during prime time. This leads to an urban bias in reporting where the news television audiences are concentrated. This also impacts the quality of television reporting as they target the primary urban demographic for news consumption, the middle class. News relevant to the lower sections of the society is thus given short drift. Cobrapost intends to remedy this glaring inconsistency in news reportage in India. Cobrapost’s vision is to function in a space where it does not depend on advertising revenue for its operations. Only in such a revenue independent framework does it envisage that the best of journalistic traditions would be upheld, and its committed journalists have all the freedom to explore and investigate cases across the length and breadth of India. Cobrapost’s mission is to stimulate, and force through investigative journalism, an informed, intelligent and sustained public discourse, which results in an affirmative reformative action in the interest of the public. Since May 23, 2013, Cobrapost.com is a non-profit entity. Cobrapost is registered with Income Tax under Section 12A and hence exempt from paying income tax. 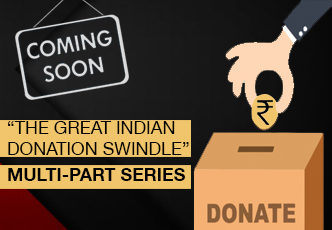 If you appreciate this unique brand of independent journalism and want to be an active member in bringing about positive change, we request you to indulge in a good cause by way of donations. All donations to Forum for Media and Literature are entitled to income tax relief under section 80G of the Income Tax Act 1961*. Your gift will directly support the real life reporting you have come to expect from Cobrapost.